Not until the first mines opened in Chasetown during the 1850's were there any houses built in the Parish. St Anne's Church was built in 1865, and is a most important link with the early history of the local community. It is a Grade II listed building both unusual and interesting in it's architecture. It was named Ann after John Robinson McClean's wife and was known as "St Anne's Free Church, Cannock Chase Colliery, Burntwood. It is a structure of brick with bathstone dressings, in the Romanesque style and was built with a chancel, nave, baptistery and a turret containing one bell. The church was constructed to seat 750 people. This Anglican church was built by the colliery for its miners to worship in. John Robinson McClean, one of the directors of the colliery, had the church erected entirely at his own expense which cost £3000 to build. It was provided as a "Free Church", for the miners of Chasetown to be able to worship. No one, however rich they were, could rent their own pew, as was the custom in many churches, because this was a "Free Church". The church was consecrated on Thursday 14th September 1865 at 11:30am presided over by the Bishop of Lichfield, the Right Reverend John Lonsdale. A luncheon was held in tents erected near to the church at 2pm. After the service, but before the luncheon Anna McClean Elliott, grand-daughter of J. R. McClean, was baptised. A section of the original cable that provided electricity to the church. The church was lit by gas from ornamental fittings until 1883. This was when permission by the directors of the colliery decided to install electric lighting being supplied from Number Two Pit, locally known as "The Fly". 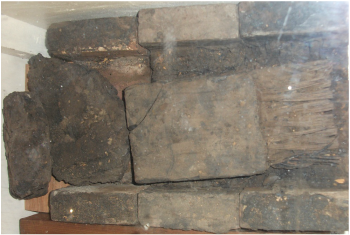 A cable ran from the pit to the church consisted of a flat iron winding rope, insulated and covered with pitch and then encased between wooden strips covered in brick channelling. The voltage was 80 DC volts, and only provided a dim light from Electroliers with several lamps hanging from the ceiling. A Bust of John Robinson McClean. 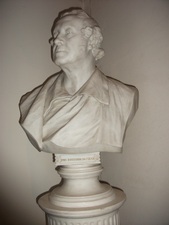 The Bust of John Robinson McClean. The bust of the founder of St Anne's Church stands in the north-west corner of the church. He was born in Belfast on 21st March 1813. 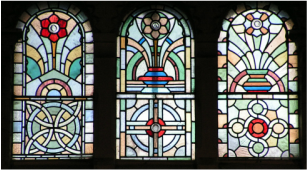 Unlike traditional stained glass windows, which usually depict scenes of the lives of saints or stories from the Bible, St Anne's windows are abstract in design. 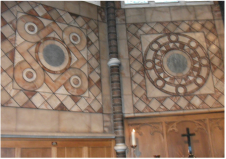 The windows throughout the church have various designs of symmetry. 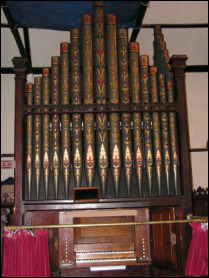 The organ was originally purchased by our benefactors from The White City Exhibition for £1000. It was built by J W Walker of London in 1864. In 1950, the church roof caught fire, dust from the roof damaged the organ and repairs cost £217. In 2004 restoration work was carried out at a cost £18,000. A service of re-dedication was held on 12th March 2005. The service was conducted by the Archdeacon of Lichfield, The Venerable Christopher Liley. A recital by Mr Paul Spicer, a nationally and internationally well known organist, composer and conductor. 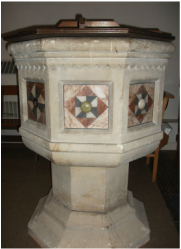 The font is made from French Caen stone. It has eight sides which each have a geometric alabaster pattern. It has a simple wooden cover and the basin is lined with lead. 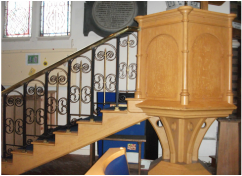 The hexagonal shaped pulpit has a brass handrail to help when mounting the steps to the pulpit. The attractively designed spindles below the handrail are wrought iron. There are seven large geometric abstract alabaster mosaics. 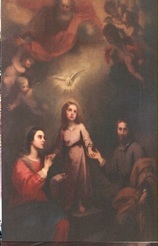 There are two oil paintings on the north-west wall. They were painted by John Lewis Reilly. 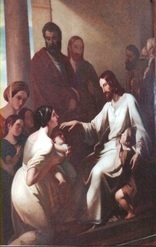 The picture on the left is named "The Holy Family" and is dated 1905 and the one on the right is called ""Christ Blessing the Children". The paintings were donated by Dowager Lily, (Lady Rose), the daughter of John Robinson McClean and cost £1500 each. 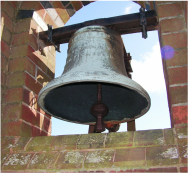 St Anne's Church has only one bell and is noted as having a rich tone. It was cast by Messrs. Blews & Son of Birmingham. It weighs 2cwt.